Scottish actor, James McAvoy is famous for his notable roles in the television drama show State of Play as well as science fiction show Frank Herbert's Children of Dune. In 1995, McAvoy started his acting career through The Near Room. X-men, The Last King of Scotland, Atonement are some of his famous movies. Till now he has been nominated for several awards including the Golden Globe award and BAFTA. James McAvoy was born on April 21, 1979, in Glasgow, United Kingdom. McAvoy is the son of a psychiatric nurse Elizabeth and a builder James McAvoy Sr. He grew up along with his sibling sister Joy and a brother Donald. Well, at the age of 7, his parents got divorced. 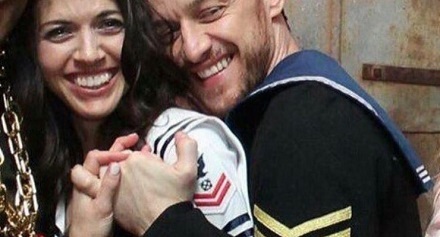 So McAvoy lived with his mother. But his mother suffered a poor health condition. So, he passed his entire childhood with his grandparents. Since his early age, McAvoy lost contact with his father. Well, he attended the St Thomas Aquinas Secondary school and finished his primary education. In 200o, McAvoy completed his graduation from the Royal Scottish Academy of Music and Drama. In 1995, at the age of 15, James McAvoy started his acting debut with The Near Room. McAvoy mentioned that he wasn't interested in acting in the starting. However, later got inspired from the co-star Alana Brady. So he started his career through PACE Youth Theatre. Till now he has acted in many movies as well as television series. Furthermore, he has also won different awards which are mentioned below. Recently in 2017, he starred in movies Atomic Blonde and Submergence. Furthermore, in 2018 he will be starring in the movie Gnomeo & Juliet: Sherlock Gnomes. Moreover, he will be reprising in the movie X-Men: Dark Phoenix along with Jennifer Lawrence, Jessica Chastain, Michael Fassbender, etc. However, in the previous series of X-Men, he has appeared along with Hugh Jackman, Patrick Stewart, Halle Berry, Anna Paquin, Josh Helman etc. Good looking guy with a great personality, James McAvoy has won hearts of many fans. Furthermore, he has also dated several girls. From 1995 to 2002, he dated Emma Neilson. Later in 2006, McAvoy started dating his next girlfriend, Anne-Marie Duff. They met each other during the sets of the Shameless. Well, they tied a knot in October 2006. In 2010, they welcomed their son Brendan. Even being parents of a son, they failed to continue their relationship. So 13 May 2016, they announced their divorce. After that in the following year, McAvoy dated Alexandra Shipp but with few months they got separated. Well, he is currently dating Lisa Liberati. Hope this couple gets married soon and live a happy life ahead. With his outstanding talents and hard work, James McAvoy is able to earn a decent amount of money. According to the recent data, his estimated net worth is $17 million.